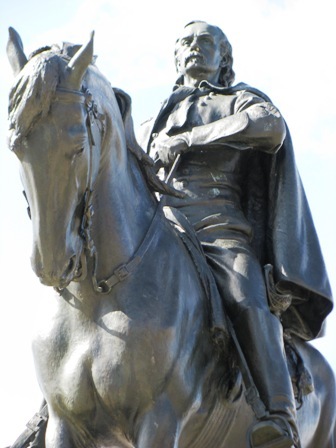 One hundred thirty-nine years ago today in the midsummer sweltering heat of the Dakota Badlands, Major General George Armstrong Custer and 600 Cavalrymen of the U.S. Seventh Cavalry were converging to attack a contingent of 2,000 Sioux and Cheyenne Indians encamped on the Little Big Horn River. 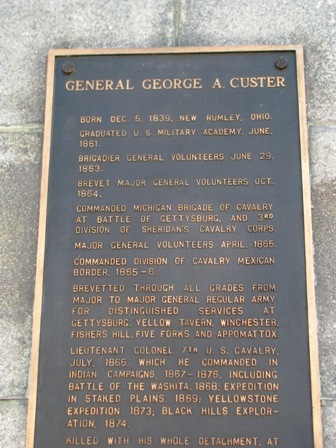 Custer’s troops were in the lead. Custer, whose strength as a commander was willingness to engage the enemy by surprise has long been criticised by historians and military experts for disobeying the command of his superior General Alfred H. Terry, (commander of the Little Big Horn campaign), who warned Custer to wait until Terry’s forces arrived to join him before Custer launched any attack. At about 5 PM this afternoon today it was the waning afternoon, 139 years ago, 1876. 225 troopers, Custer, and Mark Kellogg, the Associated Press correspondent (one of the first “embedded correspondents”) lay dead across the ridges of the Little Big Horn Valley. Mr. Kellogg’s foolscap (copy paper) littered the horror of the battlefield. Kellog was given a mule to ride by General Terry, and rode into battle with Custer. That afternoon, 139 years ago today,the superior Indian force had dealt the American military its most infamous defeat to date, which would be chronicled again and again. Custer’s accomplishments as a military commander though have suffered as a result of this alleged rash and ill-advised attack. However, the battle is instructive for all who command, (no matter what position of command they hold), to pay attention to their scouting reports,and above all conduct scouting forays, and to ignore whatever personal gains might be achieved by a personally attractive course of action (if you are successful). Allegedly, Custer had seen a possible victory lead by himself over the Sioux as a stepping stone to national office. Instead, he died in action — one of the few U.S. Army Generals to do so. 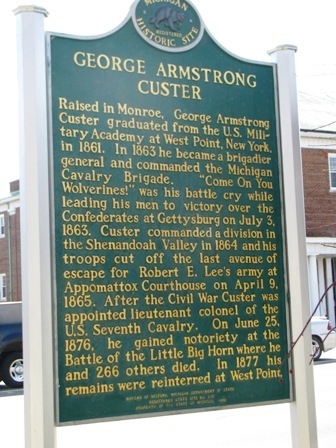 Few know today, as the statue of General Custer in his hometown of Monroe, Michigan, says how Custer was instrumental in forcing General Robert E. Lee to surrender by blocking Lee’s retreat at Appomattox in 1865. Custer’s defeat may have been inevitable but the actions of Major Reno’s premature breaking off his initial attack on the Indian encampment, a disasterous premature cut-and-run retreat, did not help Custer’s chances. Reno’s premature retreat allowed the counterattacking indians to turn all their force on Custer’s force, getting behind him, surrounding Custer and his command and killing them all within an hour. 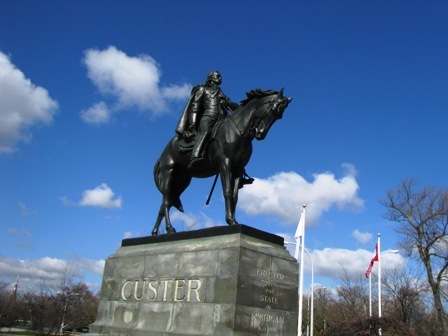 Custer’s glory achieved through his death is a sobering reminder every year for those who ignore facts confronting them, and underestimate adversaries, and discount adverse conditions. We should not forget though that Custer was attempting to achieve his mission. No one can say what really motivated him 135 years ago today in the early afternoon when he launched his attack. Second-guessing is the sport of the armchair historians and military strategists who have the evidence of the result. That is the loneliness of command. Combat. Decisions. Risks. Surprise. They are the stuff that leaders have to deal with. On this day, we should look back and remember the courage it took to engage. Remember the bravery the Seventh Calvary displayed in defeat (despite Indian reports of many committing suicide). Soldiers today demonstrate this courage every day. We need to admire that courage. I cannot fathom what it takes to be able to be courageous like that. Leading is not for everyone.